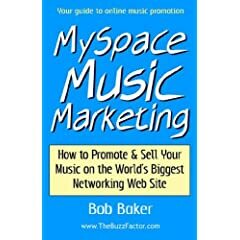 The "MySpace Music Marketing" paperback is only a couple weeks old and already it's cracked the Top 10 Music Business book bestseller list on Amazon. (Note: These rankings change by the hour.) Right now it has a sales rank of 15,343 among all books on Amazon. Not bad on a site that offers about 2 million titles. 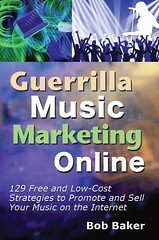 As of this writing, the "Guerrilla Music Marketing Handbook" is at #3 in Music Business books and 4,413 in Amazon sales overall. This is the first time I've had TWO books in Amazon's Music Business books Top 10. By the way, Amazon is currently offering nice discounts on each book. Grab 'em while you can. Thank you for reading and spreading the word about my work. I appreciate you more than you'll ever know. I found your book and blog via google. It's really interesting how bands etc. use myspace for promotion and networking. I've quite a lot musician friends who are/were afraid of myspace, they believe it would destroy their street credibility. It's quite funny how some artists are so careful with their public image. Too careful, I would say. Anyway... all best for you and congratulations for the success with your book. I'm going to recommend it for my artist friends. Congratulations on your books success. I've added your book to my sitetheotherside1 free music.